When in doubt, ShowTime it out! We are proud to market the best cleaner in the world. This concentrated cleaner allows you to dilute your mixture yourself instead of buying the mass-produced, watered down products being sold in the stores. We also have a committed sales team that travels the country and demonstrates the product for you. A cleaner this good cannot be bought in a local store. Place your order online today. ShowTime cleaner, when diluted 1 ounce to 31 ounces of water, is a great all-purpose cleaning mixture. Spray your countertops, furniture, woodwork, upholstery, appliances, light fixtures, ceramics, stainless steel, patio and pool furniture, Venetian blinds, or any metal surface. Just spray and wipe dry. ShowTime cleaner may be used full strength for tough problems, such as rust, road tar, driveway cleaning, de-greasing car engines, glue, and heavy soap scum buildup. Apply to areas of buildup and let stand for up to 5 minutes, then wipe it off with a clean terry cloth towel and/or rinse off. Do not use full strength in hot sun or while the surface is hot on any metal surface, such as motorcycles, house siding, cars, and trucks. Let it cool down, and then spray with a cold water hose. Then apply ShowTime cleaner and hose it off again. You may use ShowTime cleaner on glass with a mixture of 1 ounce per quart of water, or a weaker mixture of 1 ounce to a gallon of water. This depends on the amount you need to clean. Always use terry cloth towels on glass and plastic surfaces. Do not use towels that have been washed with liquid, powder, or dryer sheet fabric softeners, as they may cause streaks (as there is an oil base to fabric softeners). You may use a soft brush for textured or porous surfaces and/or hard to reach problem areas. Never over-spray. Only use 1 squirt for an average window surface, then wipe until dry. You may also clean outdoor windows by spraying the cleaner through the screens and on the glass at the same time, then come back with a garden hose and rinse off. You may air dry or use a squeegee to dry glass. As always, we recommend using terry cloth towels for best results on glass and plastics. Never use paper towels as they cause streaking. Also, never clean glass or plastics in direct sunlight. Always clean in the evening or early mornings before the sun is at its peak, as harsh afternoon heat may damage your glass. This mixture can also be used for windshields, bathroom mirrors, motorcycles guards, swimming masks or goggles, eye glasses, TV screens, ceiling fixtures, and more. It cleans and protects in one single action. Help resist 75-80% of natural hand oils and unwanted fingerprints with our multiuse cleaner. You may also use ShowTime for external cleaning of vehicles. Just use a mixture of 2 ounces per gallon of water. For best results, wash as you normally would, then rinse thoroughly and buff dry with a shammy cloth. For furniture and other upholstered items, use the regular cleaning dilution of 1 ounce per quart of water. Just spray and wipe the item, repeating if necessary. Always test for colorfastness when using ShowTime on carpets, upholstery, fabrics, and spot cleaning. For use on carpets, just spray and wipe. Repeat if needed. If the stain is still there, refer to the heat transfer method. For concrete or blacktops, spray well. Take a steel or brass driveway brush and scrub in direction of grain. Rinse and repeat if needed. You may also use a pool broom for larger areas. Spray the stain and agitate it with the spray trigger. Let it soak, and then wash it in cold water, repeating if needed. Do not put the item in the dryer until the stain is completely gone, as this may permanently set the stain in your garment. Any items that have been previously dried are not guaranteed to come clean. To boost the power of regular detergents (powder or liquid) on grass-stained clothes, work clothes, diapers, grease spots, or heavily soiled clothes, add 2 ounces of ShowTime cleaner to your regular detergent and wash as usual. ShowTime cleaner can be used to clean carpeting, either as an individual stain spot cleaner or for an entire room. Some of the most common stains ShowTime cleaner can remove are grease, wine, liquor, soda, chocolate, pet stains, gum, oil, coffee, glue, paint, grape juice, candle wax, some inks, hair dyes, vomit, urine, water stains, and rust. Always test for colorfastness when using ShowTime cleaner on carpets, upholstery, fabrics, and for spot cleaning. 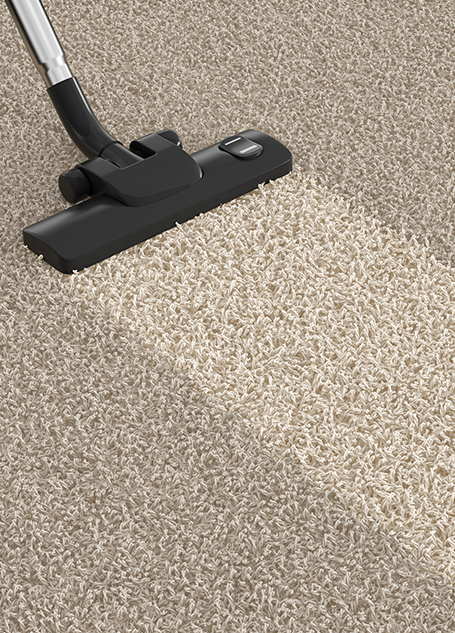 Vacuum the carpet first, then create a general cleaning mixture of 1 ounce of ShowTime per 31 ounces of water. Spray ShowTime on the stain, and let it soak for 1 minute. Wipe with a terry cloth towel until the stain is gone, and repeat as needed. For a heavily soiled carpet, dilute 2 ounces of ShowTime in 30 ounces Water. You may use a soft bristle brush or sponge mop to loosen the soil. Finish by vacuuming and air drying the carpet. We recommend a cleaning machine with a rotary brush. First, vacuum the carpet. Use a mixture of 2 ounces of cleaner per gallon of water in the machine (making sure to pre-treat heavy stains). Go over the areas slowly to allow the enzymes to work. Repeat if needed. Hot water or "steam extraction" systems have shown massive growth in the past 10 years. This process is commonly referred to as "steam cleaning," however, the system does not actually use steam, but rather hot water under pressure. This hot water is immediately vacuumed up, bringing with it loosened and dissolved soil. ShowTime cleaner is excellent for this use. Dilute 2 ounces of ShowTime per 30 ounces of water for general cleaning. If the carpet is heavily soiled, you may want to use 4 ounces of ShowTime in 28 ounces of water. ShowTime is a great choice for the removal of stains that cannot be wiped out easily, such as Kool-Aid, wine, grape juice, varnishes, and certain types of dyes or food colorings (with a #4 dye). On heavily soiled or stained carpets, apply 4 ounces of ShowTime in 28 ounces of water. Wet a terry cloth towel and wring it out until damp. Apply the towel over the stain, and set an iron on a wool setting, with steam on. Apply gently for 30 seconds at a time, being careful not to burn the carpet. Check the towel and stain. Reapply if needed. ShowTime is the best ink remover on the market. Use 1 ounce of our cleaner in 31 ounces of water, though you may make it stronger if needed. Spray on the stain and agitate the area with the trigger sprayer. Press it out with a terry cloth towel. Heavy ink stains will bleed, and the stain will become lighter but bigger. A heavy stain may require multiple applications. A helpful hint to remember is that after breaking up the stain, use a steam cleaner machine with a mixture of 1 ounce ShowTime per 1 gallon of water to clean the remaining stain. ShowTime is an excellent cleaner of metal products. For porous and textured surfaces, use a brush or scouring pad for problem areas. Expect a possible discoloration of plated brass items. Use a mixture of 1 ounce of ShowTime per 31 ounces water. Spray and wipe dry with a terry cloth towel. You may use a solution stronger if needed. 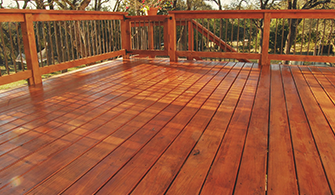 ShowTime cleaner is the best cleaner on the market for removal of oxidation and hard water stains on wood fences and decks. It is incredibly strong, yet gentle enough not to strip the wood. Create a mixture of 1 ounce of ShowTime per 31 ounces water. Spray on the area and scrub with a nylon bristle brush. This mixture works great on teak wood and plain wood trim boats. Scrub with nylon bristle brush, wipe off, and treat with wood polish. It will look brand-new again! To eliminate the buildup of soap scum, body oils, and smudges, use 2 ounces of ShowTime per 30 ounces water. Let it soak for 3-5 minutes, then wipe clean. You may also use super fine steel wool or a scrub pad for heavy buildup. ShowTime works great on lime, calcium, rust deposits, sinks, and shower glass doors. Use a nonabrasive scrub pad for stucco and tile. Use 2 ounces of ShowTime per 30 ounces of water. Heat till warm to the touch, and then apply ShowTime moderately. Heat to at least 110 degrees for 5 minutes, then wipe off thoroughly, using a damp cloth. Take a pin or sharp instrument and punch a hole in the object. Dilute 2 ounces of ShowTime in 30 ounces of water. Spray on the object and let it stand for 2-5 minutes to emulsify. Use a nylon brush to help remove the contaminant, and wipe up excess liquid. 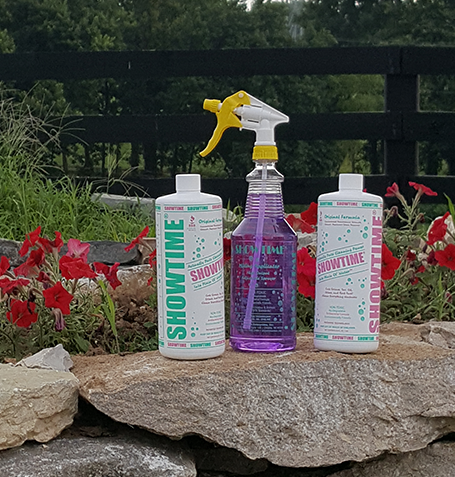 For the ultimate cleaning and care of fine jewelry, ShowTime cleaner is a must have. Just dilute 1 ounce in 1 glass or bowl of water, and immerse jewelry for up to 5 minutes. Remove and scrub with a soft brush or an old toothbrush. Rinse with water and buff dry with a terry cloth towel or other soft cloth. The sparkle and shine will amaze you. Showtime cleaner is perfect for the removal of suntan and body oils from the upper walls of the pool interior. Dilute 2 ounces of ShowTime in 30 ounces of water, spray on a sponge/scrubber pad, and rub the walls. Before you paint the pool, ShowTime cleaner will remove dirt and grime from the surface, and is an excellent pre-paint bonder. Just dilute 2 ounces of ShowTime cleaner in 30 ounces of water (stronger if desired). Scrub the surface, then brush and hose off.